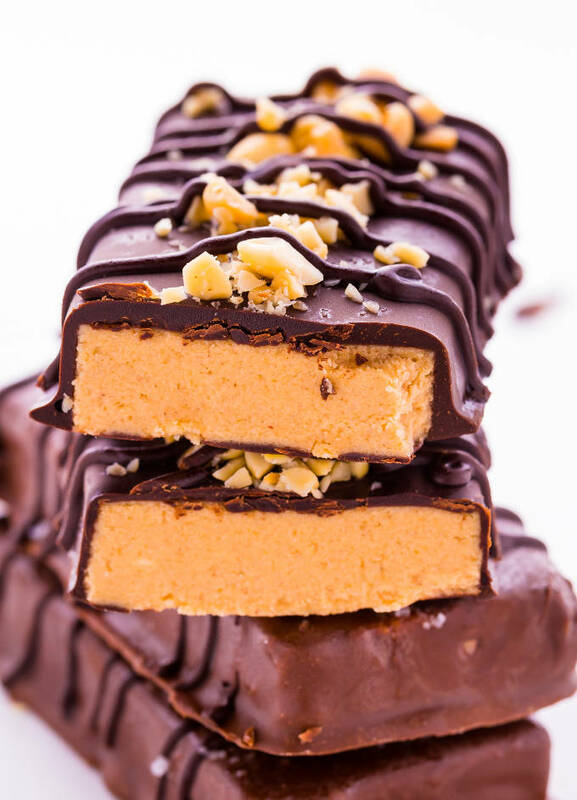 These chocolate peanut butter protein bars are made with only 5 (very healthy) ingredients. 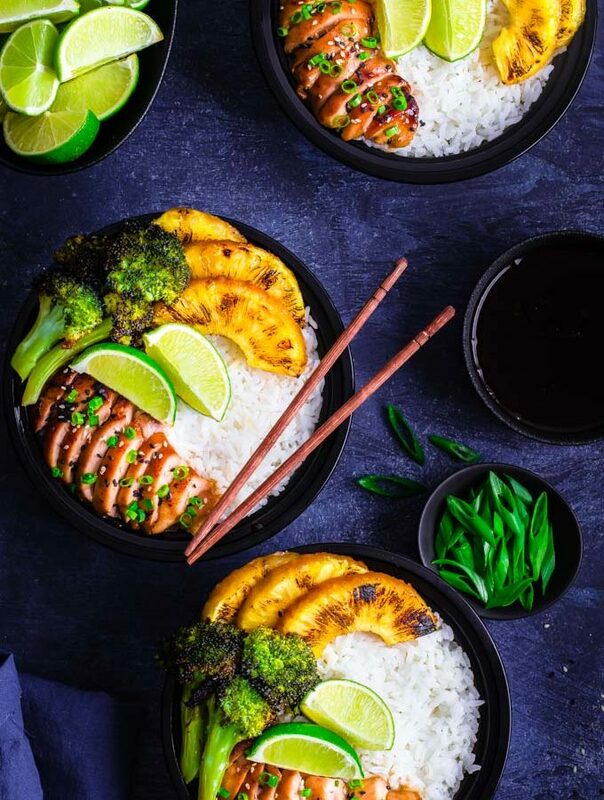 They are also very simple to make when done the right way. This clean eating snack can be enjoyed as a delicious dessert or even for breakfast! 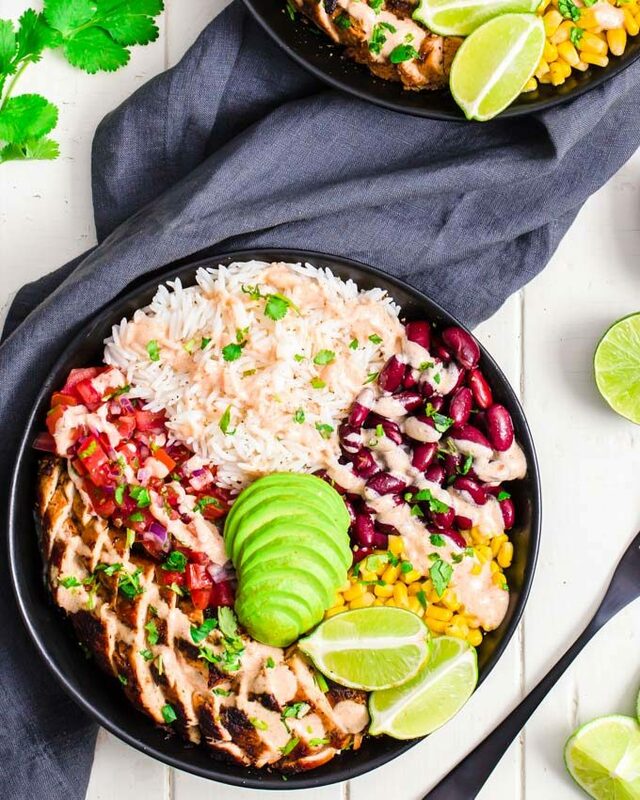 It is gluten-free, grain-free, keto, egg-free, low-carb and flourless. Dairy-free / vegan version also available in the recipe section. Chocolate coated snacks might seem intimidating at first, but trust me, they aren’t so hard to make! You’ll just have to spend a little more time in the kitchen, that’s all. 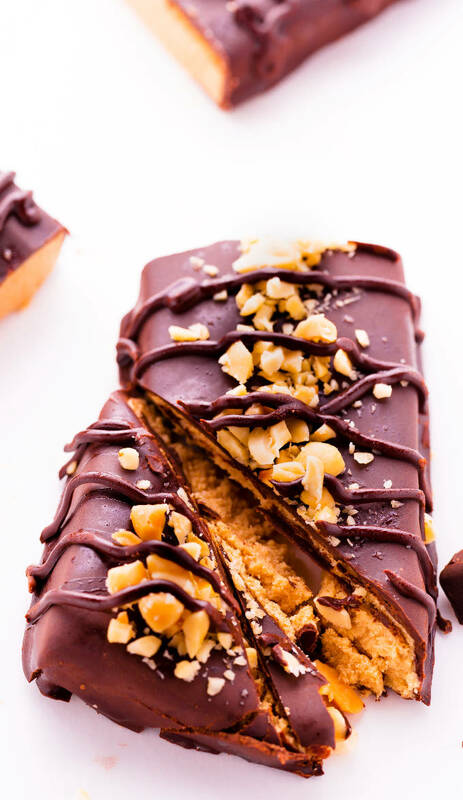 Plus, in case you’d prefer not to give it a shot, you can always pour the chocolate over the peanut butter flavored base for an easier, foolproof version. BUT. If on the other hand, you want to look like a genius self-taught master confectioner, who makes healthy & delicious protein-packed chocolate coated snacks during his/her spare time, then read on! Whey Protein Powder. Use isolate whey protein powder for the low-carb/keto version. If low-carb is not your thing though, any type of whey will do the trick. The texture “might” be slightly different from one type to another, but not enough to make a real difference. Please refer to the recipe section for the plant-based version. Peanut Butter. A cheap and reliable source of high-quality fats and protein. I just love peanut butter! Coconut Flour. Another very popular low-carb flour. This one is more tricky to work with as it absorbs much more moisture than most other types of flour. I typically use it when I want to absorb as much liquid as possible in a recipe. For this particular recipe, I wanted the inside to be thick and firm, coconut flour was the perfect addition. Coating Chocolate. 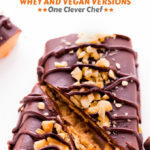 For my sugar-free, low-carb and keto crowd, you will want to use sugar-free coating chocolate. If you can’t find it locally, a quick google search will allow you to either buy some online or make your own. Additionally, this recipe for sugar-free coating chocolate from Dessert with Benefits will certainly do the trick. 1. Prepare the base. In a large mixing bowl, mix all of the ingredients (except for chocolate) until they turn into a semi-hard ball of dough. Press the dough evenly into a 10X10 inch baking pan lined with parchment paper. 2. Freeze. Place the baking pan in the freezer overnight, or for about 4 hours. 4. Cut the base into bars. Use a long sharp knife and a good cutting board. 5. Coat the bars in chocolate. Remove saucepan from heat. Line a baking sheet with parchment paper and place it near the saucepan. Hold one of the bars over the saucepan using a fork (place the fork under the bar). Pour some melted chocolate on top of the bar until it is entirely coated. Place the bar on the baking sheet. Repeat this step for every bar. 6. Freeze the bars. You can now either place the bars in the freezer or in the fridge, for about 30 minutes or until the chocolate is completely solid. 7. Store. Altough these bars are stable at room temperature, my advice is to store them either in the fridge or in the freezer, in a sealed container. They will not only last longer this way, but they will also taste better! 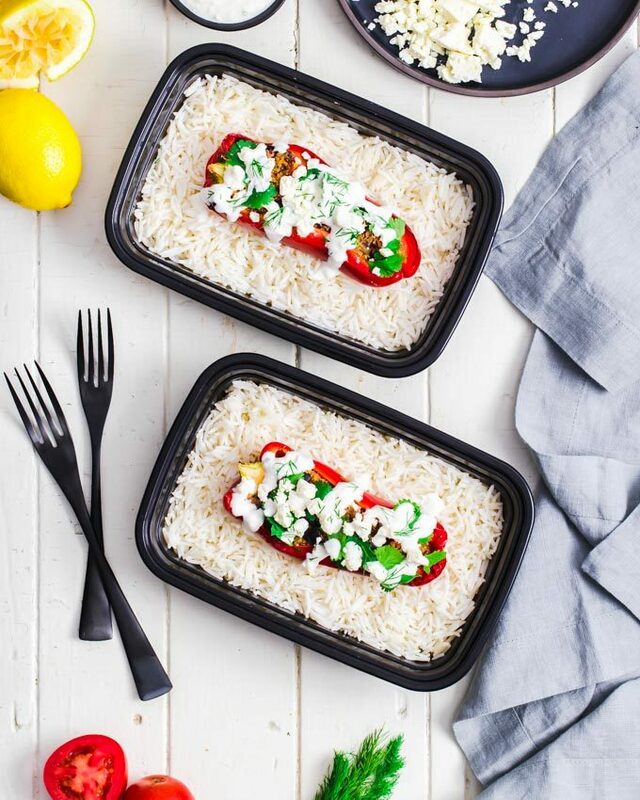 These can be kept up to 3 days at room temperature, 7 days in the fridge and 3 months in the freezer. 1. 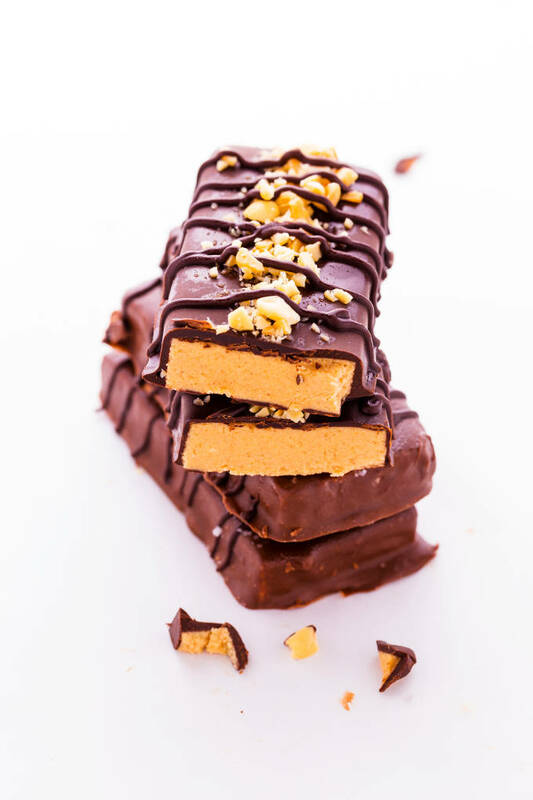 Are homemade protein bars healthy? Most of the time, I would say yes! 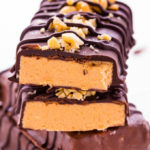 In fact, most protein bar recipes are healthier than their store-bought counterpart, for the simple reason that you know exactly what you put into them. Plus, people who eat protein bars generally are health-conscious, so most protein bar recipes you will find online will be relatively healthy. One thing to watch for though is the amount of sugar which is used in any particular recipe (and which type! ), as some recipes will call for way too much sweet. Look for recipes which call for reasonable amounts of natural sweeteners ( For example, 1/4 to 1/3 cup maple syrup, for the whole recipe, is what I would consider reasonable). 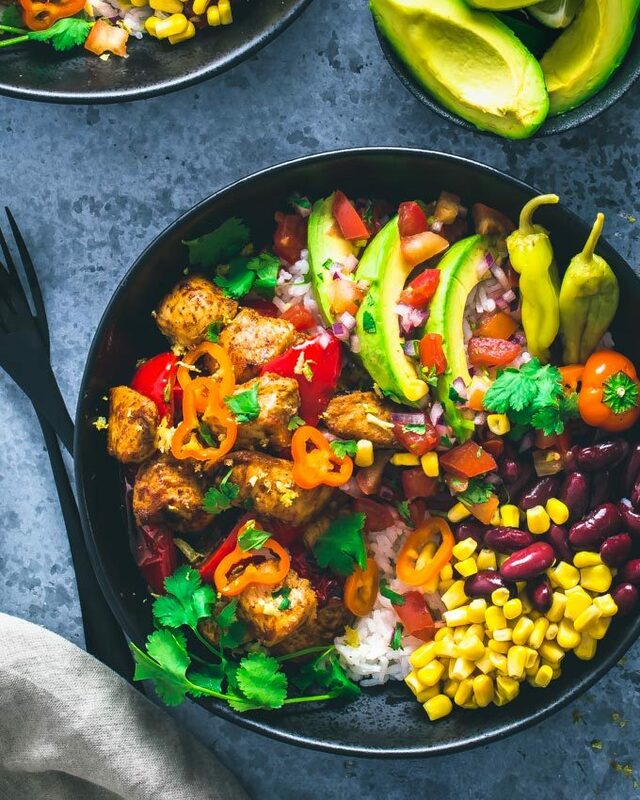 A quick look at the nutrition information label (on websites which offer them) is also, usually, a good way to know if you should skip, or make the recipe. 2. How do you wrap homemade protein bars? What I usually do is I simply wrap them in plastic wrap. If you plan on bringing more than one, place a layer of parchment paper between the bars. 3. How do you store homemade protein bars? I simply place them in a sealed container either on the counter (up to 3 days) or in the fridge (up to 7 days.). You can also keep them in the freezer for up to 3 months, but if you plan on keeping them this long, wrap them in plastic first. 4. How long do homemade protein bars last? In a sealed container: 3 days on the counter, 7 days in the fridge and up to three months in the freezer. 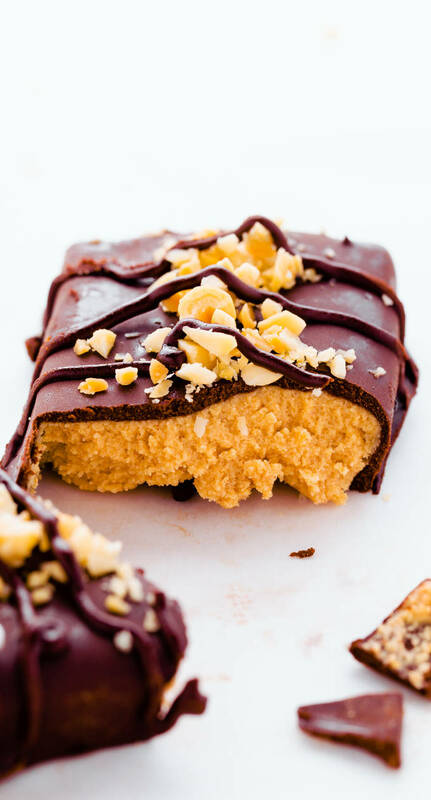 These healthy chocolate peanut butter protein bars are the perfect post-workout reward. Place all of the ingredients, except for chocolate, in a large mixing bowl, stir until well combined using a fork, then use your hands to finish mixing the dough into a semi-hard ball. Press the dough evenly into the baking pan using your hands. Transfer the baking pan to the freezer. Freeze overnight or for more than 4 hours. When you are ready to finish the bars, melt the chocolate over low heat in a small saucepan. Repeat the previous step for every single bar. Transfer the cookie sheet to the refrigerator or freezer to solidify the chocolate coating for about 30 minutes. These bars are shelf-stable and can be kept at room temperature for up to 3 days in a sealed container. 7 days in the fridge and 3 months in the freezer. * See notes for additional storing instructions. Note: Nutrition information was calculated using the whey version of this recipe only.